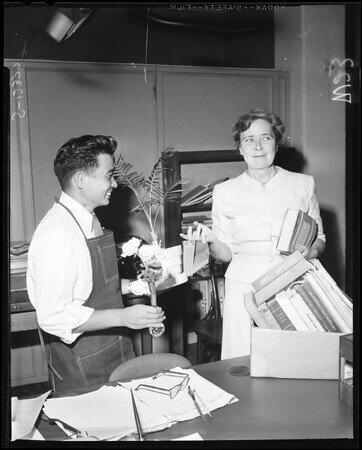 Supplementary material reads: Club photo assignment for Tuesday, June 24 at 1 p.m. Office of Helen O'Connor Wright, Los Angeles County Library, 322 South Broadway, 3rd floor. Phone MU. 9211, Ext. 4849. Picture is of Mrs. Wright packing up to leave office, retires July 1. Her husband, Carlton Wright, may be there, also.. or another person. Would like informal shot, for 2 col. use June 29".